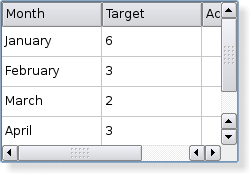 A Windows XP style table widget. A Macintosh style table widget. A Plastique style table widget. This signal is emitted whenever a cell the table is pressed. The row and column specified is the cell that was pressed. Removes all items in the view. This will also remove all selections. The table dimentions stay the same. Returns the horizontal header item for column column. Returns a pointer to the item at the given point, or returns 0 if the point is not covered by an item in the table widget. Returns a pointer to the QTableWidgetItem assocated with the given index. See also selectedItems() and isItemSelected(). 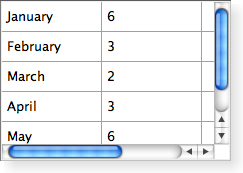 Sets the widget to be displayed in the cell in the given row and column. 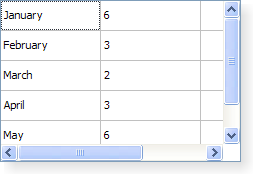 Sets the horizontal header item for column column to item. The table widget will use the item prototype clone function when it needs to create a new table item. For example when the user is editing editing in an empty cell. This is useful when you have a QTableWidgetItem subclass and want to make sure that QTableWidget creates instances of your subclass.